A thug has been caged after launching a random attack on a woman as she waited at a bus stop in South Shields. The 20-year-old was waiting on her own for a bus on her way to work at a bus stop in Whiteleas Way when she was attacked by Alan Perez. Perez, 55, attacked the woman, who he did not know, causing her to suffer a head wound in an unprovoked incident. 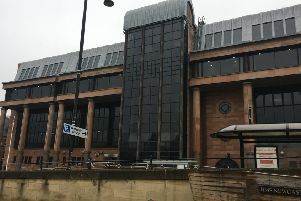 Perez, formerly of Redwood Avenue, South Shields, was found guilty of assault at Newcastle Crown Court in April and earlier this week was sentenced to eight years at Teesside Crown Court. He will serve a minimum of five years for the attack, which happened on the morning of October 20, 2015. Detective Inspector Dave Cole, of Northumbria Police, said: "Perez randomly attacked his victim causing her to suffer a head wound as she innocently waited for a bus to work and we're pleased he will now spend a considerable amount of time in prison and that justice has been done."